You’ve heard the claims, you’ve read the studies — sugar does harm to the body, causing weight gain, diabetes and countless other side effects. But what does it do to the skin? We spoke with top skincare experts to find out what some of our favorite treats are doing to our complexion. You might want to put down the chocolate croissant while you read this one. However, not everyone is affected the same way. “Some people claim their acne gets worse when they have chocolate or sugar and others notice no change,” says Dr. Elizabeth Tanzi, Co-director of the Washington Institute of Dermatologic Laser Surgery in Washington, D.C. So don’t assume that putting the chocolate bar down will eliminate all acne problems. If the blemishes do continue, make sure to visit your dermatologist to find an alternate source. “If you are not in control of breakouts, you risk getting scars from the continual breakouts,” says Vargas. “For some people, it’s just persistent discoloration. Either way, you won’t have a great complexion and you will always wish for that perfect skin.” She recommends looking for products containing kojic acid, found in her Exfoliating Mask ($75, joannavargas-skincare.com), that helps to even out pigment. Chemical peels performed seasonally by a dermatologist also help to fix texture problems and discoloration. The treatment takes less than an hour and requires a few days of recovery (dry, flaky skin is a side effect), but the result is glowing, spot-free skin. 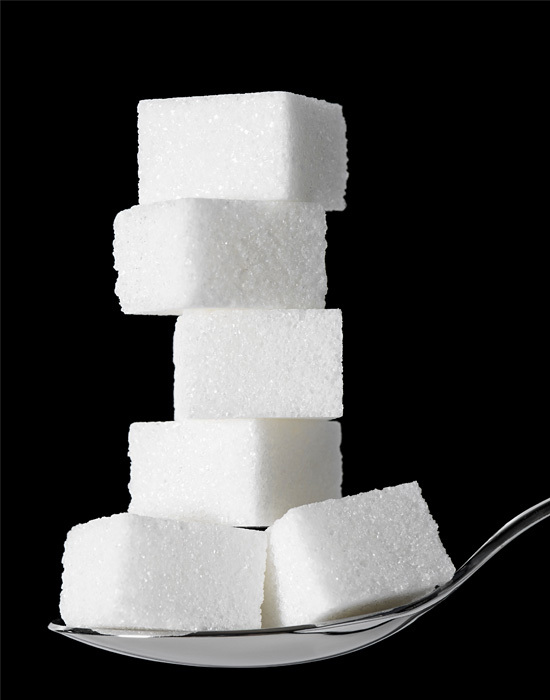 Long-term effects of consuming sugar include premature aging and scarring. Sugar attaches to proteins in the bloodstream, forming new molecules, called advanced glycation end products (or AGEs), that damage both collagen and elastin, contributing to sagging and wrinkles. AGEs also deactivate natural antioxidant enzymes, leaving the skin more susceptible to sun damage. According to a 2007 study in the British Journal of Dermatology, these effects increase at the age of 35 and continue rapidly as you age. Fight these effects with anti-aging products that contain retinoids or over-the-counter retinols like RoC Retinol Correction Sensitive Night Cream ($21.99, ulta.com), which has a milder strength so no redness occurs. Artificial sugars, although less tested, don’t get the experts’ stamp of approval, either. “For most people, artifical sweeteners are even worse,” says Vargas. “They are pure chemicals and can cause a lot of problems. Any type of impurities in the system will cause more breakouts.” They also bring on the cravings. “Recent studies have shown that aspartame may actually stimulate appetite and bring on a craving for carbohydrates,” says Dr. Frank Lipman, Integrative & Functional Medicine Physician and founder of Eleven Eleven Wellness Center. While complex carbohydrates like bread and pasta also cause sugar spikes, the simple sugars found in fruits and vegetables are less of a concern. They don’t cause high levels of insulin and instead, they are packed with healthy enzymes that are so easy to digest they boost the digestive system. However, Dr. Lipman doesn’t recommend fruit juice or dried fruit because both are very high in sugar. Vargas suggests drinking a green juice every day for glowing skin. Plus, it’s the easiest and fastest way to digest antioxidants when your skin needs a boost. Although a little sugar won’t kill you or completely ruin your skin, all three experts do recommend eliminating most of your sugar intake. Here are some easy tips to make it happen. Tanzi recommends regular exercise to use up excess sugar as fuel. (Remember, sugar is a carbohydrate). Exercise also helps to reduce tension, boost your energy level and decrease the need for a sugar lift. “Nutrient deficiencies can make cravings worse and the fewer nutrient deficiencies, the fewer cravings,” says Dr. Lipman. “Certain nutrients seem to improve blood sugar control including chromium, vitamin B3 and magnesium.” A detox like Lipman’s Be Well Cleanse eliminates sugar from the diet and focuses on a gluten and dairy-free diet. After the cravings subside, your body adjusts and no longer craves sugar. Simply adding spices like coriander, cinnamon, nutmeg, cloves and cardamom will naturally flavor foods and reduce the craving to add sugar. Lipman also recommends a little bit of Stevia (a plant based natural sweetener), raw honey or maple syrup for added sweetness. Ever notice that the more tired you are, the more likely you are to grab something sweet? Pack in 7-8 hours of sleep every night to avoid the cravings. Plus, when you’re exhausted a sugar pick-me-up is the last thing you want succumb to, since the crash is often worse than the initial tiredness. Even our breads are packed with sugars. “Remember that most of the ‘complex’ carbohydrates we consume like bread, bagels and pasta aren’t really complex at all,” says Lipman. “They are usually highly refined and act just like sugars in the body and are to be avoided.” Plus all of the following sugars have the same harmful effects on the skin: corn syrup, corn sugar, high fructose corn syrup, sucrose, dextrose, honey, molasses, turbinado sugar and brown sugar.